The new one is on the left; the old one is on the right. I think every gardener should know the air temperature where their plants are growing (indoors or out). Most people are aware that it can get too cold for plants, but if you’re not gardening in the South, you may not realize it can get too hot for plants, too. That’s why I put one on the front page of my Amazon store. Since you may not be around at the coldest or hottest part of the day, it’s very convenient to have a thermometer that remembers the maximum and minimum temperature until you get around to checking. That’s why it’s called a max-min thermometer. Every max-min thermometer (digital or otherwise) has a way of remembering the lowest and highest readings and a way to reset them. At the end of every day, shortly before going to bed, we note the maximum and minimum readings in our garden journal, along with any other noteworthy events of the day. This journal is a joint effort. My nineteen year old daughter usually records the temperature every night, as well as describing the weather in detail, friends that came over, or the occasional family adventure. I write in gardening projects accomplished, what I planted and where. So our journal has become more of a record of family life, than a book of gardening statistics, commemorating not only the first snow, but also when our friends came over sledding. I got my first digital min-max thermometer, LaCrosse model WS7014U, a little over five years ago. To find out the minimum and maximum temperatures, you have to press the In (for indoor) or Out (for outdoor) buttons, once to get the min, and another time to get the max. These buttons had stopped working consistently; we often had to press several times before they would work. So I decided to shop for a new one. I realized the only features I used on this weather station were the atomic clock and the temperature readings, so those were the features I put a priority on. But what I also discovered is that LaCrosse had come up with a new technology, which they call Instant Transmission. The old temperature sensor transmitted at 433mHz every 3 minutes and had an 80 foot range. Since an outdoor wall or window has 20 to 30 feet of resistance and an interior wall has 10 to 20 feet resistance, you were limited in where you could put the remote sensor, despite it being wireless. Furthermore, the lowest temperature it could record was -21.8F (-29.9C). The temperature did drop below this range a very few times. All the LaCrosse products featuring the Instant Transmission (look for IT in the model number) transmit at 915mHz. They have a 330 foot range and check the outdoor temperature every 4 seconds. (Not quite instant, but pretty close.) And they can record temperatures down to -39.8F (-39.9C). I don’t think it’s ever gotten that cold here. Even for those of you in the very coldest climes, the greater temperature range means fewer days when the minimum can’t be read. 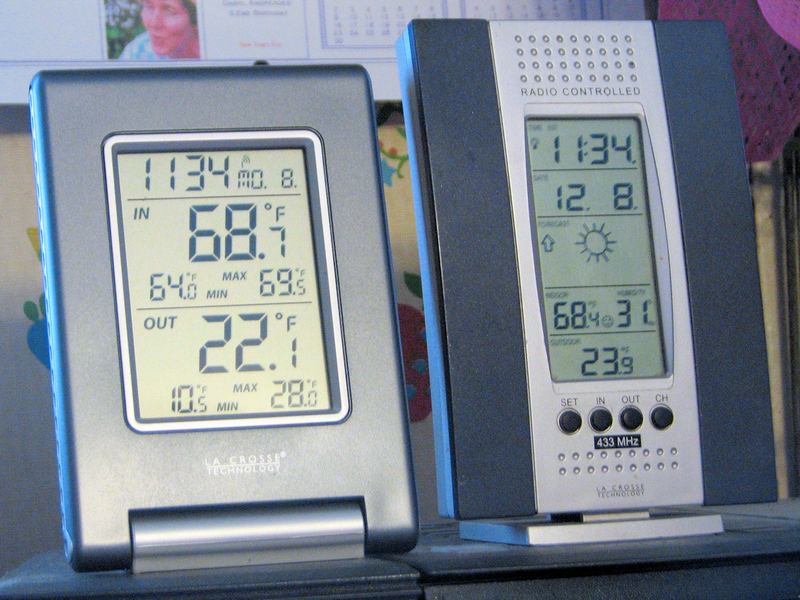 Eventually I’d like to have the equipment necessary to become one of Weather Underground’s Personal Weather Stations. That would require a much greater investment in equipment, and greater care taken in the correct siting of that equipment. It’s a goal to aim for. I’m hoping to get a good weather station later this winter. I want the rain gauge with it! One of these thermometers you have critiqued and posted about is on my Christmas List. Of course, it has been for a few years now and I still haven’t gotten one. Ha! Not much hope for it this year but you never know. Your interview with the pioneers of blogging is very interesting. I recently ran across MSS blog and found her length of time blogging to be incredible. There are so many pioneers and it is neat to know the history of blogging. You have a great blog. Lot of fun and very interesting. Lynn, I bought it on Dec. 1st and it was $21.99 then! Must be it was on sale and I didn’t even realize it.